Three drums, from the 1975 Greek set. 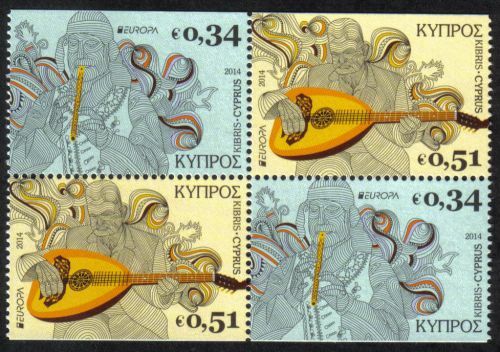 The final stamp from the 1975 Greek set shows a kanonaki, or qanun, a stringed instrument widely played in SE Europe and the Middle East. It is played on the lap, and the strings are plucked - often with tortoiseshell picks. Various tunings are used, depending partly on what scales are customary in the musician's country. In 1969 Papua New Guinea issued a set of 4 stamps showing musical instruments, SG 165-168. Here is a tareko, which I assume is a type of percussion instrument. A garamut, or slit drum, from the 1969 Papua New Guinea set of musical instruments. A kundu from the 1969 Papua New Guinea set of musical instruments. Carved from a hollowed out tree, the striking ends are covered in snake, lizard or similar skin. In 1979 Papua New Guinea issued another set of 4 stamps showing musical instruments, SG 359-362. Here is an ocarina. Ocarinas are found widely across the world, and this family of instruments is believed to date back to over 10,000 years ago. A musical bow from the 1979 Papua New Guinea set of musical instruments. Musical bows of various designs can be found in many countries. A launut - a percussion instrument - from the 1979 Papua New Guinea set of musical instruments. Apparently, it is associated with death rituals. A nose flute from the 1979 Papua New Guinea set of musical instruments. Varieties of nose flute are played in Polynesia, SE Asia, China, parts of Africa, and India. Thats kind of gross, think about it, especially if your nose is running..... YUCK!!! Nice set of stamps though. 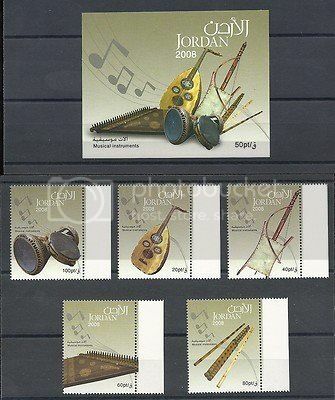 In 1977 East Germany issued a set of stamps of old musical instruments. Here is a viola da gamba from the mid-18th century. SG E1940. Note that it has 5 strings - in contrast to modern 4-stringed violins and violas. Now I feel like singing. Great selection! Come and join my wife's choir! Especially if you are a tenor - they're short of tenors! The women would give you loads of hugs. I am a tenor, sang in church youth choir and I love hugs! 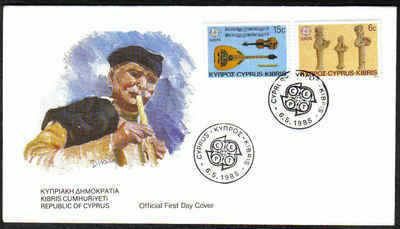 In 1984 Czechoslovakia issued 2 stamps for European Music Year. Here is one of them, SG 2733. 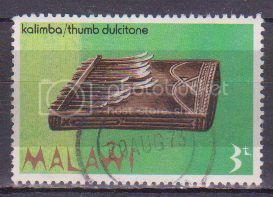 From a 1979 set of 4 Malawi stamps, a kalimba (SG 440). The kalimba (or mbira) is an African instrument also known as a thumb piano, or thumb dulcitone. It is played by plucking the metal tines. When one tine is plucked, the neighbouring tines also vibrate, creating harmonic overtones. Some here from Cyprus for you nice folks!